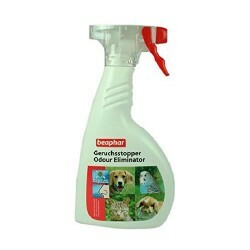 Product Information- Beaphar odour eliminator uses friendly microorganisms as its active ingredient. As soon as Beaphar odour eliminator comes into contact with unpleasant odours the microorganisms are activated and set to work, eating it away. With stubborn lingering odours, place a damp cloth over the spot. The microorganisms will remain active for weeks.It is practically not possible to bathe your dog everyday. But for hygenic reasons, you would want your dog to smell good all the time. Pet odour is not very appealing. Its always healthy to smell good.We as humans love good fragrances and always love to smell good, so why not let our pooches dogs smell good too with the amazing range of fragrances. These fragrances are absolutely safe to use for your dogs and will leave your dog smelling good for a long time. Beaphar dog odor eliminating spray uses the active operation of friendly bacteria and microorganisms. These Bacterias get activated, thus effectively eliminating those causing bad odor. If the unwanted, bad smell is intense and long-lasting, a cloth soaked in the solution, must be placed at the site. It is active for longer period of time.